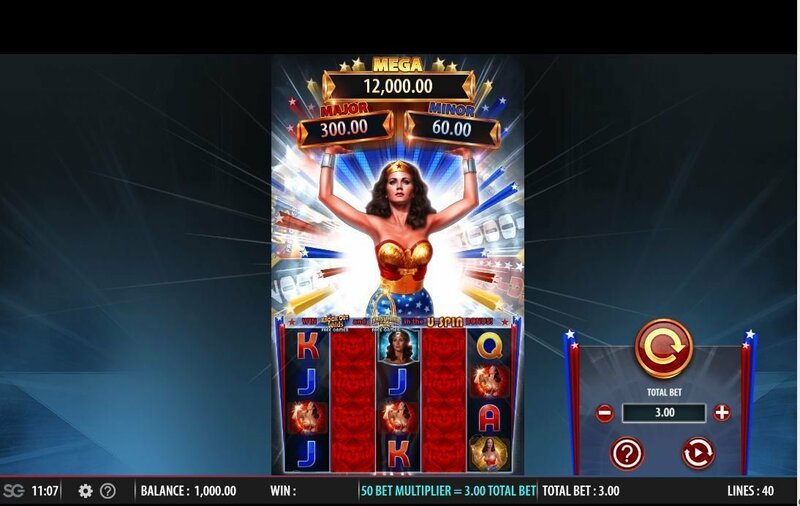 Wonder Woman Bullets & Bracelets from Red 7 Mobile/Bally Technologies is progressive jackpot slots with 40 to 100 paylines and 5 reels. 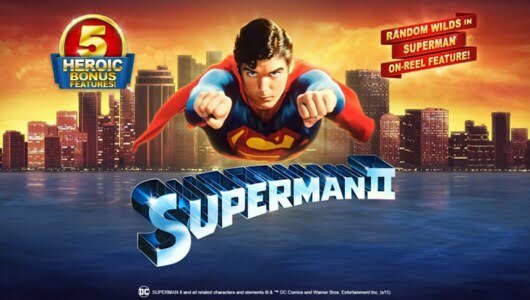 The theme of the game is based on the 1970s super hero Wonderman (Lynda Carter), personally we think Gal Gadot’s rendition of the character would have been better. 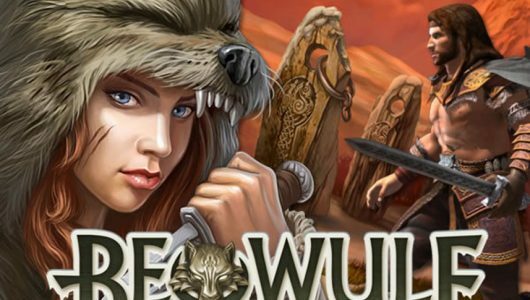 Any how, the game has a lot to offer; it contains to fixed jackpots, 2 free spins features with sticky and moving wilds with clusters. Above the reels you’ll see Wonder Woman and symbols on them are cards from Jack to Aces (low value), Wonder Woman with lassos, Wonder Woman with bullet cuffs, Wonder Woman throwing grenades, Wonder Woman running, wild and Wonder Woman’s mug shot. The latter symbol is the most valuable, 5 of them at the maximum bet pays 12x your stake. Wonder Woman has an average return to player (RTP) percentage of around 96% but volatility increases as your average bet per spin goes up. The slots is playable on mobile phones and PC desktops from £0.50 up to £50. Base game wins are good especially if the wild symbol appears in a winning combination when it replaces high value symbols (Wonder Woman) adjacent to it. Keep in mind the wild substitutes all the other symbols bar the scatters. 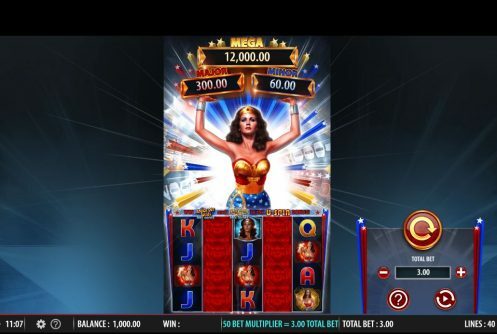 Wonder Woman Bullets & Bracelets has plenty of in play bonus modes. The Mystery Symbol bonus game can be triggered randomly on every spin, numerous symbols can be substituted by the wild or a Mystery symbol. The U-Spin Wheel is triggered when 3 bonus symbol pitch on the reels (middle reels), in return you’ll get one spin on the wheel. Cash prizes, a fixed jackpot or a bonus feature can be triggered. The Minor and Major jackpots award extra cash prizes while the secondary wheel contains the ‘Mega Jackpot’. There are 2 free spins features, the first one is the Knock Out Wild which gives you 8 free games and a stake prize. When the wilds appear during the feature they remain sticky for the big wins. An interesting snippet about the free spins is that they’re played on an expanding reel set that is 8 rows high. 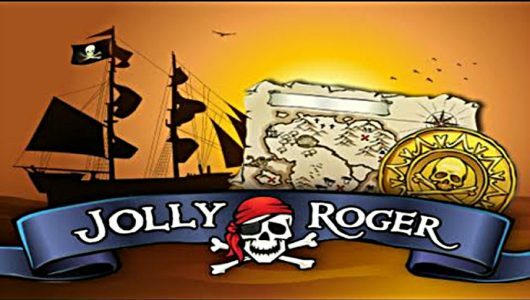 The bottom 4 rows are played on free spins 1 and 2 while on free spins 3 and 4 the 5 bottom rows are active. 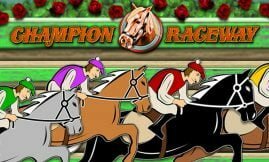 Seven rows are active on free spins 6 and 7 and on your last 2 free spins all the 8 rows (100 paylines) weave their magic. The wild symbol pops up often by replacing random symbols on each free spin. Once the feature is played you’ll get 8 free spins along with a 1x stake bonus. With 100 paylines active it is played on an eight row reel set, on each free spin random symbols are substituted by wilds. In return they become sticky and remain so until the free spins feature ends. It goes without saying they’re responsible for the big wins. Wonder Wonder Bullets & Bracelets is what we call a ‘Busy’ slots, it’s teeming with bonus features of which the Transforming Wilds free spins feature offers the biggest payouts. It takes approximately 50 to 90 spins (hopefully sooner) before a bonus is triggered. The only thing we had a problem with is that the script is a bit small, other than that it’s fun to play and can be rewarding at times. As the old saying goes there’s nothing like old school!